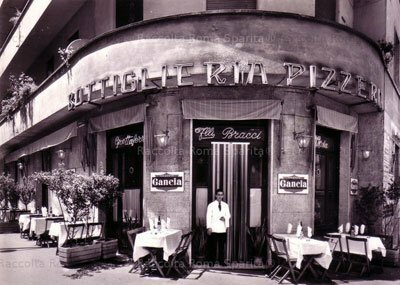 Positioned on the ark-shaped Isola Tiberina near the synagogue, Sora was founded in 1959 by Aldo Fabrizi and Sora Lella is now and run by their six nieces and nephews (check out the website for their memory lane). Near a Dominican hospital-monastery complex in a Venice-like setting, Sora Lella has a deserved reputation for solid Roman cooking, including tonnarelli alla cuccagna (with vegetable and bacon sauce), gnocchi all’amatriciana (potato dumplings with tomato and bacon sauce), coda alla vaccinara (stewed cow’s tail) and several fresh-fish dishes. 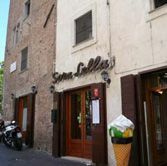 The Isola Tiberina is connected to the right and left banks of the Tiber by Roman-era bridges, the Fabricio and Ponte Cestio. The Ponte Cestio takes you directly into Trastevere, which means that after a meal you can stroll for an after dinner drink. Prices usually run about €50-60 a head.